A meserve hybrid holly with a very nice compact, mounded growth habit. 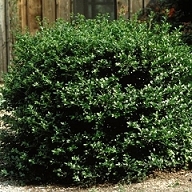 Has extremely glossy medium green foliage - very classic, traditional holly look to it. This cultivar has shown itself to be quite tolerant of both extreme cold, as well as heat. Has been known to withstand temps as low as -20 F. This holly is the result of a cross between Ilex rugosa and Ilex cornuta and was introduced in 1979. Prefers full sun, will accept some shade as well. China Boy takes very well to pruning / trimming, so it can be maintained at virtually any shape or size to fit a wide variety of uses. As the name would indicate, China Boy is a male holly, and is the primary pollinator for China Girl Holly.